Visiting from my home in Florida in the summer, I bought a copy of the excellent history of our town by Vincent May & Jan Marsh (Eds. ), Bournemouth 1810-2010: From Smugglers to Surfers (Stanbridge/Wimborne: Dovecote Press, 2010). The photographs in the book are fresher and more remarkable than any other published history of the town. However, I did a double take at the photo of “Bournemouth School on East Way 1950s” on page 162. I’m sure this is wrong, and I’m hoping other Old Boys will confirm this. My recollection from my time at the school (1959-1965) is that there was nothing to the left of the caretaker’s house except a wrought-iron railing (I think!) leading directly to the Copse. But in this photo there are rather large new buildings. Am I right in thinking that this aerial photo in fact dates from much later? Wikipedia dates the Sixth Form Block to 1966. Perhaps some Members can verify this? Many of you have been in touch to ask after the article “Schools of War” that was published in the Bournemouth Echo on 10th September. The piece tells how Bournemouth welcomed pupils from Taunton School, who were evacuated from Southampton due to the German bombing campaign. The article was mentioned at the year’s annual dinner. Neil Bichard was kind enough to scan the piece to this PDF file. David Hilliam arrived at Bournemouth School in the 1960’s as a teacher of English. He progressed through Head of Department to become Deputy Headmaster for many years, until his retirement. Outside of school he and his wife were the mainstays of the campaign to save the Winter Gardens. He was also a prolific author. In this respect his subjects were varied, but included several books of a historical nature, the origins of the names of many stations on the London Underground, along with books of local history and the derivation of English words. In 2001 he was the editor of the excellent Centenary Book for Bournemouth School, copies of which are still available and more recently he produced Tig’s Boys, edited letters between Headmaster Dr Fenwick and Old Boys of the school sent from the trenches during World War I. At the time of his death he was working on a book concerning Bournemouth School and World War I, intended to be released to commemorate the 100th anniversary of the Great War. David died on April 30th 2012 while attending a church meeting in Salisbury. His wife, Mary, had died in February 2011. Our sincere condolences go to his family, particularly daughters Sandra and Alison and son Paul. School historian David Hilliam’s latest book, Tig’s Boys, is a collection of letters to a schoolmaster from the trenches of the First World War. You can purchase the book through Amazon here, and doing so will benefit the OBA. Frank Daniel (1937-41) has sent in a number of photographs from a school play which occurred sometime during his years at Bournemouth School. They appear to have been taken in the area known as ‘The Copse’. 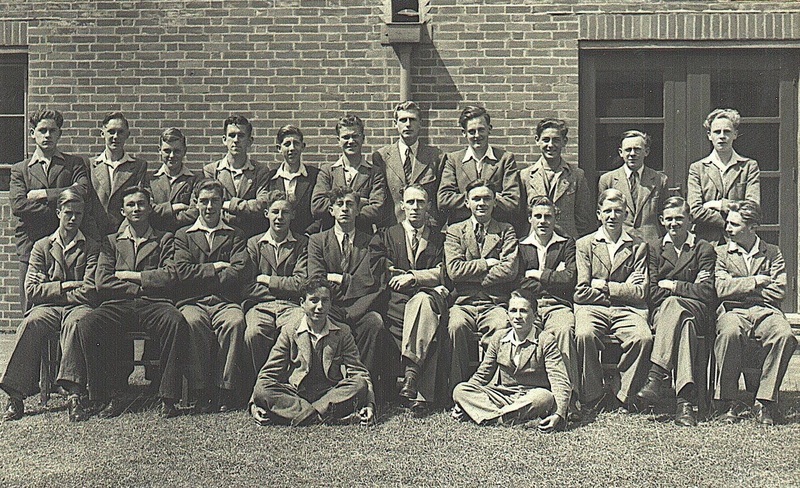 Mick Fionda (1947-52) has sent this picture of a Bournemouth School cricket team taken in 1952. “I thought this photograph of 1952 may raise a few laughs with someone, somewhere,” he says.